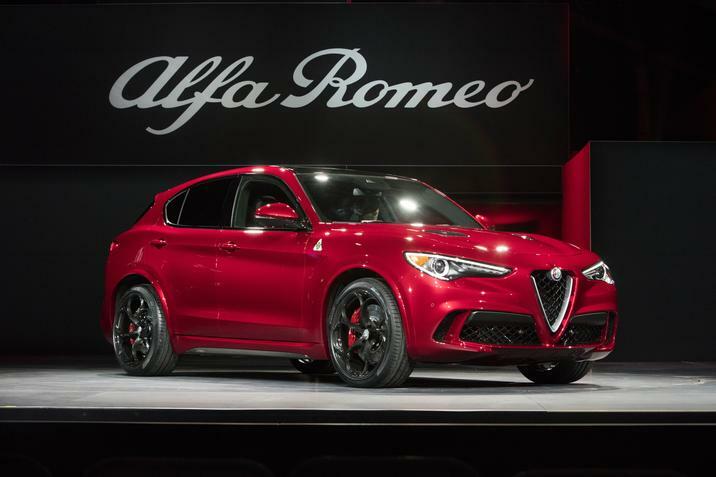 Stelvio expands Alfa’s North American product line to three. A familiar front fascia graces this 2018 Alfa Romeo Stelvio. The 2018 Alfa Romeo Stelvio will soon arrive in dealer showrooms, the third US model for this premium Italian brand. The Stelvio joins the 4C sports car and the compact Giulia sedan, expanding Alfa’s reach into unchartered territory. Indeed, that dominion is long dominated by the premium German makes — Audi, BMW, and Mercedes-Benz. This means that every shopper is a potential conquest buyer as Alfa brings forth its first-ever SUV. Named for the famous Stelvio Pass in northern Italy, the 2018 Stelvio shares its underpinnings with the rear-wheel drive Giulia. Unlike the sedan, the Stelvio has standard all-wheel drive. 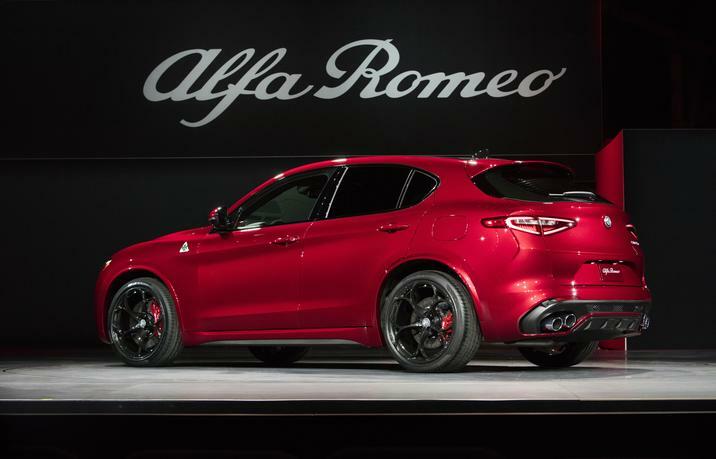 Like the sedan, it will also offer a high-performance Quadrifoglio version arriving later. The Stelvio’s chief competitors include the Audi Q5, BMW X3, Mercedes-Benz GLC, Jaguar F-PACE, and the Porsche Macan. Certainly, stiff competition. Fortunately, Alfa Romeo has priced the 2018 Stelvio competitively, from $43,985, including destination. Even when playing with the Stelvio’s price configurator, I managed to keep the final cost below $50,000, or within the realm of competing models. Specifically, my add-ons included special metallic paint ($600), 18-inch five-spoke aluminum wheels ($500), an 8.8-inch touchscreen display with Bluetooth and navigation ($1,550), satellite radio ($350), and a pair of driver assist packages totaling $2,300. However, don’t expect such price restraint when the high-end, fully-optioned Quadrifoglio debuts. The upcoming 505-horsepower SUV may top $70,000 when all is said and done. A beautifully crafted steering wheel underscores this model’s handsome looks. All 2018 Stelvio models come with a 2.0-liter twin-turbo four-cylinder engine paired with an eight-speed automatic transmission. A sport-tuned suspension provides swagger and, hopefully, without much sway. In any case, a 5.4-second 0-60 mph time is in the offing. Standard equipment includes 18-inch aluminum wheels, bi-xenon headlights, LED daytime running lights and LED taillights, and leather seats. Packages and upgrades bring in 19-inch wheels, a sport-tuned suspension, black roof rails, sport steering wheel, and steering wheel-mounted paddle shifters. A heated steering wheel, sport leather seats, wood trim, and other amenities expand this model’s offerings. On the safety front, the 2018 Stelvio goes well beyond a standard rearview camera by offering a pair of driver assist packages. The Driver Assist Dynamic Plus package ($1,500) brings in automatic high beam headlamp control, forward collision warning with pedestrian detection, and adaptive cruise control. An infrared windshield (useful for reflecting light and reducing heat) and lane departure warning round out the package. Buyers may also choose a Drive Assist Static With Front Sensors package ($800), outfitted with blind spot and cross path detection, front and rear park assist, and automatic dimming side mirrors. All in all, the 2018 Stelvio represent’s Alfa’s strongest North American entry to date. The competition is most certainly stiff and that means Alfa must execute flawlessly. If successful, Alfa may soon find itself in the company of the world’s best luxury brands — and that’s no small feat for a make largely unfamiliar to most Americans. This pictured Quadrifoglio edition has a quad-tip exhaust system. See Also — What’s Next for Alfa Romeo? Photos copyright Alfa Romeo Motors.